After my Father wrecked or sold ever car he owned. He began using his Mother Veronica’s decade old, beat up car to get from A to B and not much further. The trunk was so dirty that your hands would instantly turn black once you unlocked it. The seats were torn and tattered and the floorboards were often covered with debris and weeks worth of empty fast food containers. Regardless, we were able to fit my Father’s 6’4 frame, our dog, myself and up to eight kids piled up in the backseat. The Hawkins brothers Keith, Petey and M.J., Glen, Tommy and whoever else would risk the trip on that day. (Aside from those named. The cast would always change depending on the day and who was willing to brave the back seat. Once there, we would often disperse into two separate tribes or war parties as my Dad would set up camp and build a fire to roast hot dogs, marsh mellows or whatever supplies we manged to gather before our voyage. In the few hours we’d stay we’d play war, burn tires and grab whatever we could from the abandoned cars and the nearby railroad tracks. In truth, there was no Tarzan or nearby water to be found. For the life of me, I may never learn how or why it came to be called “Tarzan Island.” But as I would come to learn at the time and many years later. It was what everybody called it. Year later, I’m talking decades. I returned to Sunnyside Queens to seek out the area. The train yard itself was still there, but it had been closed off and closely patrolled. Whoever said, “You can’t go back.” was probably speaking from countless heartbreaking attempts. We headed out to Queens this afternoon to do some exploring in Long Island City and Astoria. Our first stop was 5 Pointz where we checked in to see what new pieces had gone up and which ones had survived since our last visit. The more often I go the more I find myself talking to both the visitors and artists. Talking about art, paint and the spots I might have missed or perhaps would like to share. Today I met up with Slone (That’s him posing in front of his latest piece) and talked a bit. We exchanged info and if things go as planned I’ll be tagging along one day to shoot a piece in the making. I don’t get to work on many morning sessions these days due to conflicting schedules and the fact that most of the models I’ve met are not exactly morning people. This was not the case with Tanu . When we first exchanged schedules for the week, she suggested 9:00 AM. “Whoa, I said. Perhaps a bit too early for me to be at my best. We settled on 10:00 Am agreeing it would still give us plenty of time to get things done. When I met her at the PATH my first impression was her pictures didn’t even come close to conveying her beauty or personality. Tanu was awesome and our session conveyed it. Her expressive eyes and lips had me pausing to catch my breath. An absolute professional and a pleasure to work with. We stopped here and there but for the most part, we never really got off course. Tanu was born and raised in New Delhi India and lived in Brooklyn, NY before moving to Long Island City. I hope to be doing a lot more morning sessions in the future. We’ll certainly see. I can’t think of many better ways to start the day. I had a little time on my hands yesterday and was looking for a little adventure. So I jumped on the train and headed from Chinatown to Long Island City to check out what was new over at Five Pointz. I’ve blogged about the place before and it’s stunning graffiti. One of the great things about the block is that the block is forever changing and evolving with new pieces and murals going up all the time. When I was growing up in nearby Jackson Heights I was exposed to the culture at an early age. 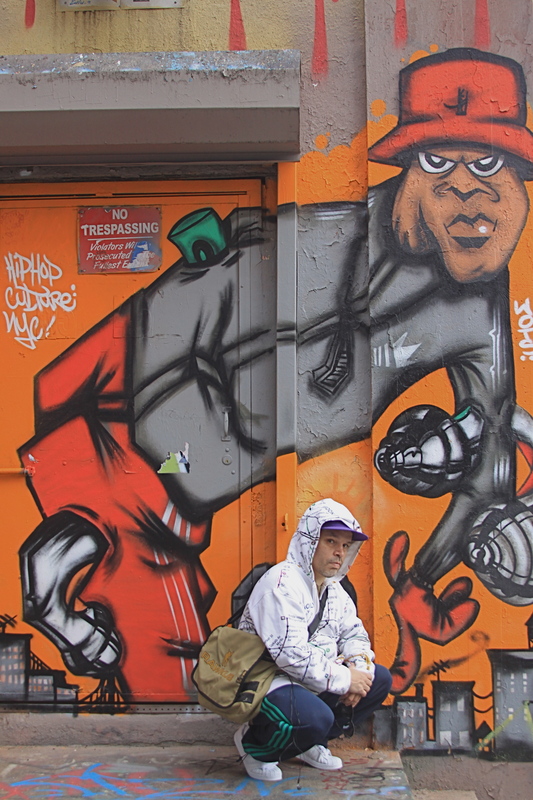 There were plenty of graffiti crews and individuals with a wide array or styles and talents. Most of them were looked at as vandals and criminals and a lot of it was in all honesty crap. Yet so many had real talent and originality. Often taking it to the next level as artists and graphic designers. I always wished I was a better artist. Don’t get me wrong. Photography has made me very happy. But to be able to create something like that using pure imagination and talent is amazing. If you get the chance to go there I highly recommend it. Take the E train to 23 Ely and walk two blocks south. That’ll get you an eye full. Oh and stay the hell away from that general store by the train. 1.40 for a can of soda should be punishable by death. Today I packed up my camera and head to Astoria, Queens to meet up with my old friend Tony Crisos. I met Tony a few years ago when we worked as photographers for a company called Freeze Frame. (More on Freeze Frame in my next blog.) Tony was always an absolute pleasure to work with and be around. He might have only been a few inches taller than me but his personality made him seem like a giant. Tony’s thick Greek accent made him tough to understand but that only seem to make us all listen a little closer I can recall the countless times I would bust out my “Tony the Greek” impersonation. Something I am still working on. At one point we had all departed from Freeze Frame but had formed a strong bond and always talked about getting together for work or just to hang out. After a few months of playing phone tag and planning we finally got together today. Tony was nice enough to pick me up from the train station. A few seconds after jumping into the car Tony joyfully commented that it was just as if no time had passed and we were just picking up where we left off. He was right. The couple of years that had passed felt more like a matter of days. The only difference was the thick beard and mustache made him look like he had recently joined the witness protection agency. We stopped for breakfast at the Grand Cafe on 30th avenue before embarking on a tour of the neighborhood. Tony is an accomplished Jazz guitarist but if he ever decides to give up on music he has a bright future as a tour guide. towards our final destination Astoria Pool. It was always a long trip. We never had any money (Maybe just enough for a soda and a slice on the way home.) so we couldn’t afford to train it. Walking and perhaps stealing a ride on the back of the bus was our only option. I remember we’d often opt for hopping the pools fence rather than pay the thirty five cent admission fee. For a kid between the age of seven to ten it was an adventure.our final destination Astoria Pool. It was always a long trip. We never had any money (Maybe just enough for a soda and a slice on the way home.) so we couldn’t afford to train it. Walking and perhaps stealing a ride on the back of the bus was our only option. I remember we’d often opt for hopping the pools fence rather than pay the thirty five cent admission fee. For a kid between the age of seven to ten it was an adventure. After lunch at the Grand cafe he gave me a tour of the neighborhood. Everything from the side streets, little nooks and corners. To Socrates Sculpture Park and of course Astoria Park. I had a great time and enjoyed Tony’s easy going nature. There’s something very special about Astoria and the people who live there. You can’t help but want to be a part of it.